Guest contributor Laura Kelly describes some of her favorite things to do in Northwest Michigan Lake Country. We had heard that the local farmers markets were worth checking out, and thought that would be a good start to our one-day exploration. Soon we were headed out to Boyne City, six miles directly south of Walloon Lake Village. 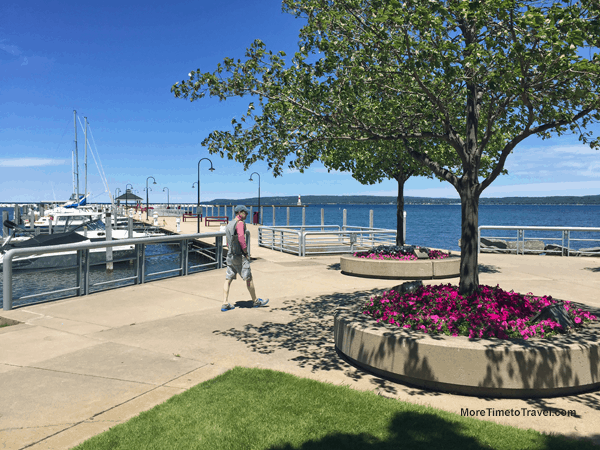 Boyne is a cute boating town, situated at the foot of huge Lake Charlevoix and their Wednesday farmers market was right next to their sailboat-filled marina. After buying two pints of early strawberries at the market, we walked around the town (its tagline is “Where Life Meets Lake”), which has a river running through its gazebo-graced lakeside park. On this gorgeous mid-week day, the town was markedly uncrowded and we had fun checking out the boutiques and various restaurant menus. Red Mesa Grill on Water Street had a mouth-watering Latin American menu (and great TripAdvisor reviews). We also perused the windows of the numerous real estate offices and found that there were no Walloon Lake cottages for sale for less than $2 million (this gives you some idea of what these “cottages” look like). Another house fantasy dashed. We headed 20 minutes north to Petoskey (which made Smithsonian Magazine’s list of “America’s Best Small Towns”), a much larger town than Boyne City but still small at less than 6,000 residents, and famed for its shopping, restaurants, and Little Traverse Bay (a large U-shaped indent of the vast Lake Michigan coastline). We checked out all of the above, with a special focus on the wonderful McLean & Eakin Booksellers (see novelist Ann Patchett’s 2015 New York Times essay about this store) and the nationally renowned American Spoon artisanal foodie shop. Just wandering around on some hilly side streets above the waterfront, we came across two great-looking side-by-side restaurants with outdoor patio seating—The Twisted Olive and the much smaller Palette Bistro. We picked Palette because we liked the interesting list of sandwiches and salads. We made a good choice. The sandwiches on chewy grilled sourdough bread were scrumptious—I got a delicious grilled veggies sandwich dripping with romesco sauce, feta, and herb aioli, and Warren enjoyed the pan-fried hake filet sandwich with a tomato bacon remoulade. My little side salad of a creamy balsamic fresh pasta salad was unexpected and tasty. Delicious sandwiches and salads on a shady patio at Palette Bistro in Petoskey. These ancient rocks are smooth glacier fossils that bear the lacy traces of a coral reef that once existed in these waters. The local shops sell polished specimens of the stones, but I wanted to find one of my own. My husband had doubts about this quest, especially after we had fruitlessly searched the stony beaches in the strong sun for 30 minutes. And then, eureka, I somehow spied a small Petoskey stone amongst all the other rocks! With a bit of polish our find would make a great pendant for a necklace. I’ll add three more far-flung destinations to her list: Mackinac Island, particularly if you can go before or after the July and August crowds. (The leisurely bike loop around this gorgeous island is not to be missed.) And seeing/climbing the huge sand dunes at Sleeping Bear Dunes Park (90 minutes south of Walloon, near Traverse City, along the shores of Lake Michigan ) is a real once-in-a-lifetime Michigan experience. Finally, the famous Interlochen Center for the Arts (if you love music, you’ll have already heard about this place) is 30 minutes south of Traverse City. My itchy camera finger is wishing we’d had more time in Northwest Michigan Lake Country to do all the above so I could share more photos here!